Mighty Travels says American has the most generous frequent-flyer program among the three giant lines and Delta has the worst. IdeaWorks says Southwest and JetBlue are best among lines in the United States, followed by United, Alaska, American, and Delta. Some insiders like Alaska’s program because it has good award deals on partner lines. Consumer Reports found Spirit was pretty bad, but didn’t find any clear winners. Given the range of opinion, what should an occasional traveler do? Here are some considerations. Location Rules: No matter what the relative merits of individual airline programs, your choice may well be dictated by where you live and where you usually travel. You have to go with that, no matter what. Elite Status: Fuhggeddaboudit. Delta and United have already announced a switch from the miles you fly to the dollars you spend on airline tickets as a basis for elite status, and American will probably follow once its program fully merges with US Airways. Alaska and Hawaiian may follow. 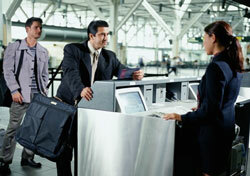 Elite status, with its access to upgrades, is the main goal of real frequent travelers. But occasional travelers, by definition, don’t fly enough to earn elite status under the old rules and they surely don’t spend enough to make it via the dollars. Occasional travelers will not get upgrades—period. Special Treatment: Lacking elite status, the other way to get preferential treatment is to use a credit card cobranded with an airline. American’s AAdvantage World MasterCard, Delta’s Skymiles AmEx card, and United’s Mileage Plus Explorer Visa card, all $95 per year after the first year, offer one no-charge checked bag each per trip for a couple (up to four travelers on some) and other benefits; Hawaiian’s World Elite MasterCard offers the no-charge checked bag to just the cardholder. United’s card provides primary rather than secondary collision coverage for rented cars, a big plus. Even if you don’t travel much, one of these cards could easily pay for itself in reduced fees—especially United’s, if you rent cars. Cards from Southwest and the smaller lines also offer benefits, many tied to faster earning of credit. Mileage Basics: For now, the general formula that 25,000 miles gets you one domestic coach round-trip looks pretty safe for Alaska, American, Delta, and United. First class generally requires double. For an economy round trip to Europe, American’s 40,000-mile off-season award is a lot better than the 60,000 miles on Delta and United. Business class to Europe is 110,000 to 125,000 miles. As an occasional traveler, you’d probably take two to three years to pile up enough miles for a domestic round-trip, and far too long for the bigger awards. The Value of Miles: These days, long-haul coach round-trips cost around $400 and often more, so as long as the basic domestic coach award remains at 25,000 miles, the value is inching up past 1.5 cents per mile. Of course, you have to adjust the value of miles to reflect the difficulty—sometimes extreme, on Delta—of getting an award seat when and where you want it. You get at least double that value when you use miles for first or business class. Augmenting Miles: The only practical way to augment your airline miles is to use a credit card that pays one mile per dollar charged to the card (two miles for airline tickets), as several airline cards do. If you put as much as you can on a mileage credit card, say $1,500 a month, you’d earn that award trip in about a year and a half. Dollars or Miles: Good cash-back cards pay 1.5 to 2 cents per dollar charged, so charging that same $1,500 a month would earn $270 to $360 each year, which you could use to buy tickets with no limitations. Whether to go with airline miles or cash back is a close call for earning domestic coach tickets, but miles are a no-brainer if you use them for business-class or first-class awards anywhere. Ed Perkins Seniors on the Go is copyright (c) 2014 Tribune Media Services, Inc.